Employers receive thousands of applications for each advertised post every day. How can you make sure that your job application secures a position on the top of the pile? The answer, no doubt, is a well written CV. This is your introduction and first communication with the employer. Despite of your professional experience, may it be 14 years or none, your CV decides whether you are going to be considered for the job or not. Remember, if your CV is poorly written and is full of mistakes, it will portray you as a careless candidate and you will not even stand a chance for the interview call. For a first good impression, this is your best chance that fate hands you over when it comes to applying for a job. The National Commission on Writing, reports: "Eighty percent or more of the companies in the services, finance, insurance, and real estate (FIRE) sectors & the corporations with greatest employment growth potential, assess writing during hiring." After getting an appointment for the interview successfully, comes the second important factor, i.e. your oral skills. The modern world of corporate, technology and learning has laid strong emphasis on basic communication skills. Some people have a misconception that like other qualities, even this quality is in built in human nature, something that is by birth but this is not true. At any stage of life you can build these qualities within yourself. If you look around your professional environment, you will find out that employees who write & speak well are better positioned to succeed in their career, eventually making more money in comparison to the ones who lack skills in this important area. However, not every career requires strong writing or communication skills but more opportunities are open to those professionals who do possess them. See if you can answer some of the questions listed below. Take your business off the ground? Move up to the top of your company? 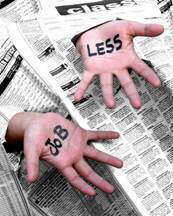 Find a job - in any economic situation? It is a fact that job seekers, who are incapable to communicate themselves clearly while they write or speak, limit their opportunities for professional-salaried employment. The way of speech and writing differentiates a highly-skilled & highly-paid professional worker and a janitor. If you look at the above mentioned 10 points closely, the top 2 of the list are bad writing skillsand secondly bad oral communication. These are the major turn offs of an employer and must be avoided at all costs. The basic thing is to realize your mistakes and the areas you require improvement in, it is only then you can avoid them and achieve your targets. The article is divided into two sections giving you tips as to a) How to improve written skills? b) How to improve oral skills? It will also guide you about how to build and refine in these two areas. a) How to improve written skills? Evaluate the current condition of your written skill. Compare something written by you, even if it is a paragraph from your cover letter, with a professionally written one. If it lacks in spelling and grammar, then for you, practice is the key to success. If you do not practice you will not gain anything. You can write about an incident that happened to you or about anything interesting that caught your eye when you were walking on the street. Or you can write your comment for a blog article. Or rewrite your cover letter. It doesn't matter what you write as long as you attempt to write something. Shoddy writing discredits you in the eyes of your employer, and if you are writing for publication, it makes more work for your editors. We all let errors escape sometimes, but you should not make it a habit. When you have written something, even if it is a comment for something you have read on web or in a newspaper, take time to proof read it a few times. This will greatly reduce the errors that do get through. Technology has made life easier, so as a precaution run spelling and grammar check for your written piece which will indicate any spelling or grammar mistakes it contains immediately. Courses can give you a good guidance to writing. Reading, however, is another important aspect to be considered to help you. Reading books is a better option but reading an English newspaper will also help you profoundly in this regard. You can read the fiction or non-fiction books of a wide range of categories. This would allow you to observe the styles of various authors. Writing is a fundamental professional skill. Most of the new jobs today emphasize on writing. If students want professional work in service firms, banking, law, finance, insurance, advertising, TV channels or real estate etc., they must know how to communicate on paper clearly and concisely. When you have mastered the skill of writing, you will have renewed confidence in yourself. We all know how the ability to succeed in one area spills over into other aspects of our lives. A good musician is also a good student; a good sportsperson is also a good leader, and so it goes. You'll be amazed at the opportunities that are available to you when you know how to write well. With the rapid growth of on-line courses you can even opt for an on-line creative writing course. But this will be more beneficial for the professionals related to the writing filed. For most of us, internet has become a part of our lives. So while you are online, browse for a website which offers useful writing tips and information for improving your writing skills. Best is to subscribe for their newsletter. Subscribing to newsletters is free and you will get loads of information through the useful articles. Also you can go to dictionary sites and learn new words, their meanings, pronunciation and correct usage in a sentence. This is called fun- and-learn technique and you learn things without even realizing that you have gained knowledge, by only looking at a word or hearing the correct pronunciation. Write something and allow it to be read by a critic. If you write but never show it to someone to read and edit, you might not be able to spot the mistakes in that piece of writing. Once you have written something, proofread it and check it for errors. Then get a critic, he could be a friend or a teacher or your big brother/sister. It would be great if the person is experienced i.e. with good written skills, to comment on your work. This critic will give you feedback on your work and you can learn how good your standard of writing is. Even if your first writing gets a lot of criticism do not lose heart. Take the experience as a learning one and remember not to make the same mistakes again. At management level, effective oral skills are important to create an environment of open communication, to recognize non-verbal signals and to develop mutual understanding. You need to master oral skills for both in-person and over-the-phone interactions. Giving presentations and debating viewpoints effectively. Read aloud for 15-20 minutes on daily basis. Research has shown that it takes about three months of daily practice to develop strong mouth muscles for speaking a new language. It may seem a bit hard but it's worth it. Well-written magazines, like The Economist and Dawn, are great to read not only to improve language skills but also to learn more about the world. In terms of books, read what interests you. The basic goal is to read as much as you can. People tend to forget basic grammar when writing e-mails. An e-mail is nothing more than a letter which is sent electronically. Make sure salutations and content are professional. Pretend you are a newscaster and read out the newspaper to your mirror. Record your own voice and listen for pronunciation mistakes. This is a very important exercise because doing it will help you become conscious of the mistakes you are making and you will avoid them automatically when you speak next time. Hence, practice makes a man perfect. If you speak hurriedly with the wrong accent and tempo, people will have a hard time understanding you. As you are in learning and rehearsing phase so don't worry about your listeners getting impatient with your slow speech. It is more important that everything you say is clearly understood. Acquaint yourself with the phonetic symbols of your dictionary. Look up the correct pronunciation of words that are hard for you to say. There are numerous online dictionaries with the audio options for pronunciation. They can be a big help in this regard. Also try to learn one new word on daily basis and use is in your conversation. This will help build your vocabulary as well as strengthen your language while communicating. Make a list of frequently used words that you find difficult to pronounce and ask someone who speaks the language well to pronounce them for you. Record these words listen to them regularly & practice saying them. Listen and read at the same time. This exercise will produce effective results in less time. Pay special attention to 'S' and 'ED' endings. This will help you strengthen the mouth muscles that you use when you speak English and will refine your speech. You can change the way you speak but it cannot happen overnight. People often expect instant results and give up too soon. You can change the way you sound if you are willing to put some effort into it. Focus on removing the mother tongue influence that creep into your English conversations. Watch the English news on television channels like CNN or BBC. Most important, don't be afraid to practice. The message is, "If you want to succeed in your professional life, you have to be able to speak and write well!"